Odden’s Rural Life Tours is in its 9th year of offering tours to Scandinavia focused on rural life, folk arts and learning how people live in modern Norway and Sweden as well as how people lived at the time of immigration to North America. The scenery is spectacular, the people warm and interesting and modern day Scandinavian food is delightful. Our modern motor coach is incredibly comfortable. Else and Phil will be your guides as you experience Scandinavia with your fellow travelers. Our 2020 Midsummer Celebration tour to Norway and Sweden will be similar to our 2018 tour described below. Updated itinerary and prices for this tour will be posted in late summer 2019. Any questions, please give us a call at 715 468 2780. Our 2018 Odden’s Rural Life Midsummer Celebration Tour to Sweden and Norway is indeed a celebration of midsummer. We will experience the sights, sounds and tastes of midsummer at a time when the sun never sets. Else and Phil have offered this tour in 2013, 2015 and 2016. This tour was very successful and well received. We will be gone 13 days. We will be six days in Norway and seven days in Sweden. The tour will begin in Oslo from the Gardermoen airport. We will fly home from Stockholm. Odden’s Rural Life Tours focus on rural culture. We offer insights into folk arts, music and food culture as well as modern agriculture and rural living. We look into the era at the time of immigration and learn how people lived at that time in Scandinavia and the possible reasons people immigrated to North America. The first leg of the tour will take us north through the agricultural region of the Gudbrandsdalen valley in Norway. This is the area where Phil’s ancestors came from and the area where Else and Phil met while attended carving school back in the late 70’s. We will experience both the inland culture of Gudbrandsdalen and the coastal culture of Norway from Åndalsnes north to Trondheim, the Viking city. Near Røros we will cross the border into Sweden and spend three days celebrating midsummer in the Dalarna region. Dalarna is no doubt the region in Sweden with the most traditional cultural midsummer traditions and it is said to be the place in Sweden that every Swede would like to be for midsummer. Many say that Midsummer is the most important holiday in Sweden, more important than even Christmas and we will find out why. We will arrange for special visits to private homes as well as public events during our three day stay in Dalarna. The tour will end in Stockholm. We will have an orientation and guided tour of the city upon our arrival. The following day will be a free day to explore the city or hang with Phil and Else as they explore their choices in the city. Travel from Minneapolis to Oslo with Iceland Air. We have seats reserved with Iceland Air departing from the Humphrey International terminal. There is a stop in Iceland to change planes for the continuation of the flight to Oslo Gardermoen airport. You may also arrange for your own air transportation and meet us at the Gardermoen airport if you wish. Humphrey is the smaller of the two terminals at Minneapolis with easy access. The airport in Iceland is small and easy to navigate. The first leg of the flight is about 6 hours and the second leg is about 2 ½ hours making for a rather easy travel day. Phil and Else will be there to assist in any way possible. Upon arrival at Gardermoen airport we will collect our luggage and have an opportunity to exchange money. We will board our modern motor coach and head north to Lillehammer. It looks at this time that Stig Johanneson will be our chauffer. Else and Phil have worked with Stig on past tours and value his commitment, good nature and ability to safely and comfortably transport us on our adventure. We have arranged for a special welcome dinner. As the tour begins people will begin to get to know and enjoy the other interesting people on the tour. If you wish to take a hike or a stroll in the evening our comfortable hotel is conveniently located to do so. Lillehammer is a very picturesque small city and the sight of the 1994 winter Olympics. Maihaugen is a large and extensive open- air museum. Our morning tour of Maihaugen will give us a special insight into how people lived in Gudbrandsdalen at the time our ancestors immigrated to North America. From Lillehammer we will travel north to visit the Ringebu Stave church dating from the 13th century, a local woodcarver and basket maker, a local farmer if he is not in the fields, and we will end up at a charming rural hotel near Dovre near the carving school where Else and Phil met in 1977. We hope to visit the carving school if possible. Our destination for this day is the Atlantic Ocean Highway north of the city of roses Molde and the small island of Håholmen where we will overnight in comfortable seaside cottages. On the way we will cross the alpine meadows of Lesja and view the majestic Trollveggen mountains of Romsdal before we arrive at Åndalsnes on the Romsdals Fjord by the North Sea. Near Åndalsnes we plan to be welcomed at a small farm overlooking the Fjord where we will be served a tasty lunch. Håholmen offers enchanting summer surprises with plenty of fresh North Atlantic air for a quiet restful nights sleep while the sunset transforms to sunrise without a period of darkness. From our Håholmen island retreat we will travel to the small island city of Kristiansund where we will visit the petroleum center and learn about the modern Norwegian petroleum industry. There will be an opportunity to stroll the wharf along main-street and have lunch. Our modern rural hotel at Orkanger offers a number of interesting surprises. We have arranged for a special evening meal and orientation. From Orkanger we will continue north towards the Viking City of Trondheim. Before we get to Trondheim we will cross the Fjord to the island of Rissa where we will visit the Norwegian Coastal Culture museum. There is an active professional wooden boat builder at the museum where they always have an interesting boat- building project underway. We will learn about the fishing industry at the time of immigration and what it took to fish effectively on the North Sea at that time. When we arrive at Trondheim will have arranged for an introductory city tour and orientation. As we arrive in Trondheim we have arranged for a guided tour of the city. There will be time to stroll the streets of the old city and visit the shops. We will also have a guided tour of the thousand-year-old Nidaros Cathedral. This is the furthest north Cathedral in Europe and continues to be the destination of Christian pilgrims from southern Europe. We will learn why. On this day we will travel east toward the Swedish border. We will visit a small family farm that was purchased by a Norwegian who made money during the Klondike gold rush. The farm has been restored and the people offer a well- informed, interesting story and view on immigration from Norway to America. We will be served cake and coffee. From there we will travel on to Røros an enchanting high mountain mining village with many buildings dating from the 1600’s. We will take a short walking tour of the town and learn about the life of miners back- in- the- day. There will be fun shopping opportunities here in this tradition rich town. We will stay in a comfortable hotel at the foot of mainstreet where they serve interesting food prepared very well. On this day we can expect to see reindeer along the road as we will be traveling through the territory of the Southern Sami. Reindeer graze year around on the open range of the higher wooded mountains in this area. Those who are interested in horses and are able to ride will have the opportunity to do a 2-3 hour trail ride on Icelandic horses from the town of Stuggudal on the way to Røros. There will be an extra charge for the horse ride that will follow trails close to the Norway-Sweden border. If you are not an experienced rider this is probably not the time to learn to ride but we expect to have well trained gentle horses to ride. From Røros we will travel over the border towards our hotel in Rättvik beside Lake Silian. This region of Sweden is heavily wooded. The Swedish Forest industry is known to be among the most advanced in the world. We will stop and tour a mountain museum in a small mountain village where we will learn about the local forest culture including the local Sami culture. Here we will have lunch at a local café. Later we will stop at another rural café at a Febod or summer farm for coffee and cake. Finally we will arrive at our modern hotel in Rättvik where we will spend the next three nights in the heart of the tradition rich district of Dalarna. We will have several places to visit while in Dalarna during the height of the Mid-summer celebration. We will visit a Dala Horse factory where they carve and paint the Dala Horses that have become a national symbol of Swedish culture. There will also be a tour of an ornamental black smith shop. We will meet other artists and see their work. We expect to be invited to visit a refurbished traditional Swedish home. In this situation there is always coffee, tea, cakes, and cookies involved. At midsummer the wild flowers are blooming everywhere. Explanations and stories regarding how the natural world is combined with teachings of Christianity to celebrate midsummer will be offered. In the past we have taken the opportunity to attend a church service and watch the long Church Boats being rowed onto the beach in front of the church. These are colorful events rich with music and tradition. People are dressed in their traditional garments adorned with fragrant wild flowers. Special summer celebration food is the norm and room must be saved for the tantalizing desserts. We will attend the raising of the traditional May Pole on Sollerøn on Lake Silian. Here we will have an opportunity to dance around the tall freshly adorned May Pole to lively fiddle music with the locals. The brightly clothed smiling laughing children are most special. School in Sweden has just finished and the luxurious endless summer is at last at hand. Breakfast and dinners at the hotel. Leaving Rättvik we will drive to the village of Sunborn where we will have a guided tour of the Carl Larson family home. Carl Larson was a great Swedish painter who was a strong influence of traditional Swedish design. From Sunborn we will travel to Stockholm. Upon our arrival in Stockholm we have arranged for a guided city tour starting from our centrally located hotel to orient ourselves with the city. We will locate different places and things to see and experiences that people may wish to do on the following day. We have planned a tour of the Vasa museum to learn about the great warship that sank in the Stockholm harbor and now has been restored. This is a day on the town in Stockholm. Else and Phil will offer suggestions as to where to go and what to see. If you wish to see parts of the town with Else and Phil you are welcome to do so. If you wish to check the city out on your own, that is fine as well. Phil wants to see Skansen open air museum and parts of the Old Town while Else has yet to make her choice. We will be close to the Royal Palace and City hall where the Nobel Prize dinners are held. It is also possible to take a day tour on the Ferry around the harbor. There will be time to do last minute shopping and pack your bags for the flight home. Day 13 - Stockholm - Shuttle from hotel to the airport. Tuesday will be a travel day. Our flight will take us from Stockholm to Reykjavik to change planes and then on to Minneapolis. Prices for our 2020 Midsummer tour will be posted in late summer 2019. Land package pr. Person with double occupancy. Phil and Else Your hosts, guides and tour organizers. Ingrid in her beautiful Swedish bunad cutting roses for her Midsummer celebration. 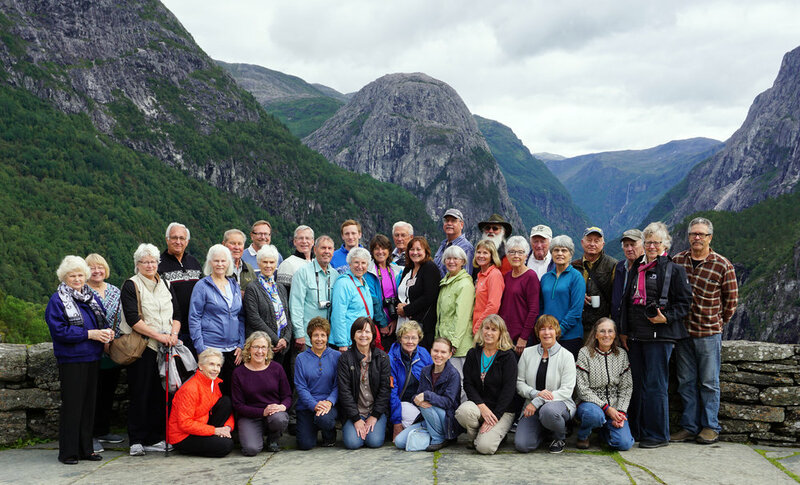 Thank you to a great group of travelers who joined us for our Odden's Rural Life Tours; Folk-Art, Fjords, Friends and Fun tour to Norway in August 2017!